Do you believe the future of your business relies on your HR management strategy? It’s really tough to keep & manage the records of your staffs and ensure a perfect plan for your business growth. Fortunately, there are HRM solutions available for you to track all the records and reports. Use a WordPress HR plugin to make your job done easily with automation. Your people are the pillars of your success. Give them enough space. Lead them in a smart way. Treat technology as a gift. The win will be yours at the end of the day! Why Human Resource Management is so important for your business? Human Resources are an essential part of every organization's management framework. You can’t ignore your human resources at any level of your business. Just check out why your human resource management is so important and the ways it could help you. HRM effectively helps to achieve better performance and satisfaction building strong employee relations. You can manage your complete recruiting procedure from scheduling interviews to sending appointment letters etc in a perfect way. 7. Improve the strategic management of your company. 8. Take care of the wages and salaries of the employees. let's discuss some facts before choosing the best WordPress HR plugin to automate your business. These are the facts you should really consider as an HR manager. You will be able to ensure the best result when you know the challenges. This is the most important fact you should care about at the very beginning of your business. Discover the right people for your project. Use the theories and practices of human resource management to hire the best people. Human resource is the second pillar for your business next to your business idea. Sometimes HRM helps to make your idea more appropriate and powerful! Right people or the best employee doesn't always indicate the skilled people. You could upskill your people by proper training but can't change someone's mind and thinking. So try to recruit the person with a perfect mind and balanced thinking. Train them to lead your business to the next level. Employee recruitment usually a long process. Today it's now considered as the past reality. There are options for you to use HR management software to hire right people without any hassle. You could easily make your job done using a WordPress HR plugin. The surprising thing is- most of the HRM solutions have artificial intelligence. This is one of the most important facts you need to ensure to get the best outcome. We people are usually different in our thinking and behavior. You should care the matter from the very beginning to ensure flexible work adjustment. Be aware of poor management offenses to avoid misunderstanding and unsatisfaction among your people. Always try to maintain a flexible working hour and environment. Your success mainly relies on your team. Make a team. Keep your trust in team-power. Focus more and more on collaborative work. 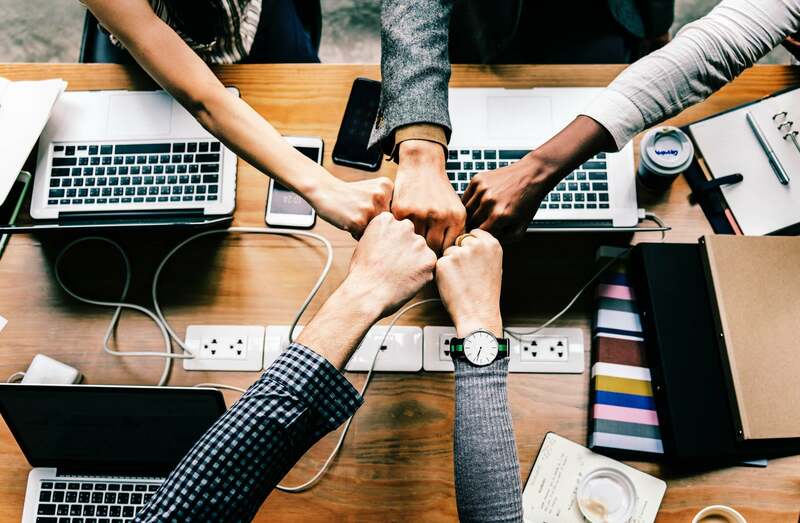 Gain is yours when your employees are happy in the team. In today's competitive business era, you can't ignore this fact in any way. Expert managers around the world get powerful results using automation. Manual management in this technological era is just hazardous. Select the best HRM solution for your project. Ensure a quantum leap over your competitors. 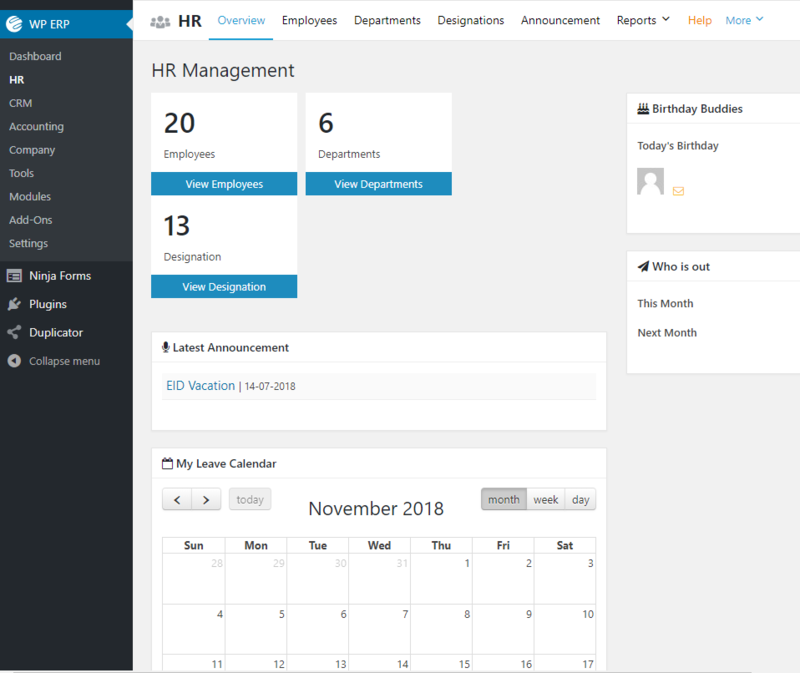 There are a number of features you can get using an HR management solution. Your project size or employee headcount isn't a matter to worry about. You will be able to perform all of your duties by just fewer clicks. Check out some fundamental features of an HR management solution. You already know the importance of human resource management for your business. Also, your challenges as an HR manager, why to prefer automation and how to ensure the best output. Now is the time to select the best HR management software for your startup project. There is a huge number of HR management software or plugins in the WordPress industry. Staffer, Staff Directory, WP-HR Manager, and WordPress ERP are some of the big players within the community. Our pick for you certainly is the WordPress ERP. The question here isn't- why? But the question is- why not? What you will get with WPERP? WPERP is the best WordPress HR plugin both by its number of users and rich service providing history. You could check out WPERP‘s power and uniqueness in any way you have. WPERP is an all in one-type company management solution. And it's free! It has all the four essential section for your company. Why HR Module of WPERP is the best suit for your small business? Check out some output you can get using HR Management of WPERP. The best WordPress company management plugin developed and marketed by weDevs. 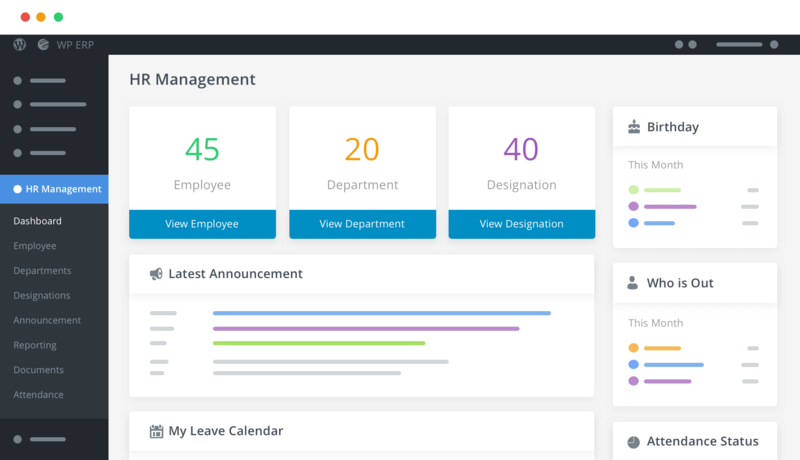 Take a quick overview of this sample image- how HR Management actually looks like from your dashboard. Add and install this amazing WordPress HR plugin to start the action. Follow the step by step guideline to add any WordPress plugin to your site. Go to your dashboard and follow the instructions. Just take a look at below screenshot. Now add and edit all of your employee information. You can manage your HR department using available sub-menu items like Employees, Departments, and Designations under HR Management. It's such easy to manage everything with the HR module of WPERP! 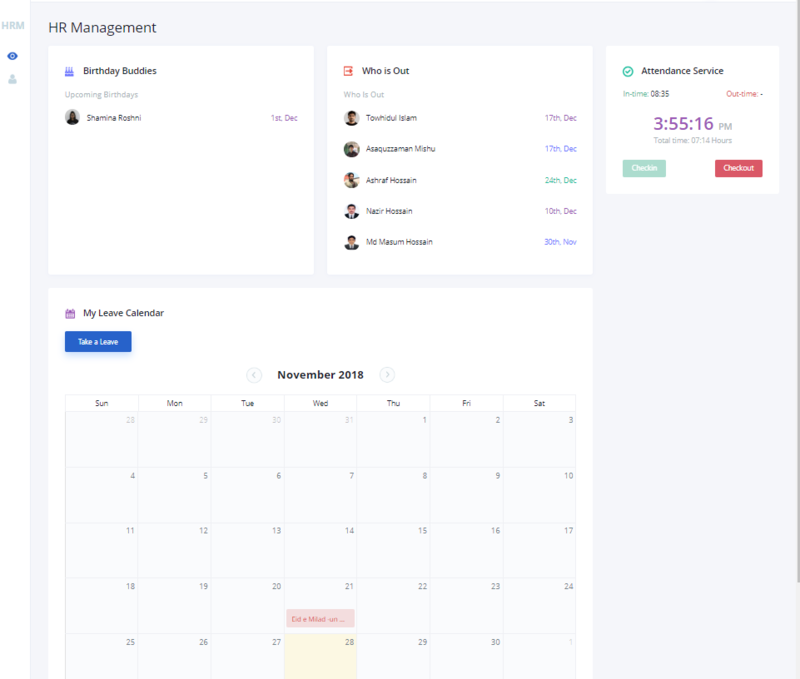 How does your HR Management look like from your frontend? Here is the real view of how you could look your HRM from the frontend. Add all your employee information to get the most output. Note: There is an option for you to add this WordPress HR module to your site's frontend. You will be able to add or edit everything from your frontend. That's obviously easy and more secure option for you. This wonderful opportunity you could get only with the HR module of WPERP. Now you know WordPress HR plugin is certainly easy yet the most useful option for you. Start your journey with the best HRM solution of the industry today and ensure the perfect growth of your business.